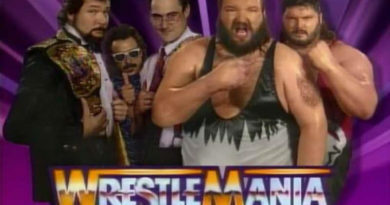 Wrestlemania V was dubbed “The Mega Powers Explode”. 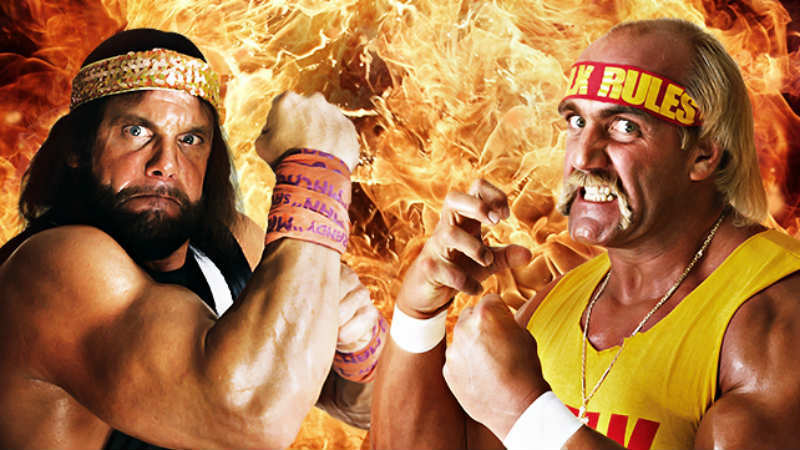 The Mega Powers was comprised of the WWF’s two biggest superstars: Hulk Hogan and Macho Man Randy Savage. The Mega Powers became a team around Wrestlemania IV when Macho Man won the tournament to become the new WWF World Heavyweight Champion. After Wrestlemania IV, The Mega Powers continued their feud with The Million Dollar Man and Andre The Giant culminating at the 1988 Summer Slam. When this feud ended, The Mega Powers began a new feud with the formidable team of Akeem and The Big Boss Man, known as The Twin Towers. In the main event of the 1988 Survivor Series The Mega Powers and The Twin Towers headlined their 5 man tag teams respectively. The match ended with The Mega Powers being the sole survivors of their 5 man team, although not before The Twin Towers could begin a feud that would ultimately lead to the breakup of The Mega Powers. It began when the Dr. of Style, Slick, grabbed Miss Elizabeth at ringside. Hulk Hogan was quick to come to her rescue, leading to a 2 on 1 beat down by The Twin Towers. 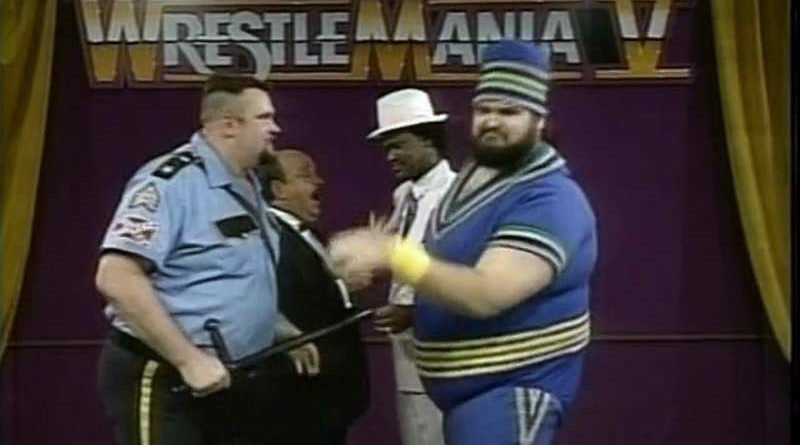 While Hulk Hogan was being handcuffed to the ropes, The Big Boss Man was eliminated via a count out and Akeem was disqualified for pushing the referee giving the Mega Powers a 2-1 advantage in their Survivor Series match. One week before the 1989 Royal Rumble on an edition of the Saturday Night’s Main Event, Hulk Hogan was wrestling Akeem in a singles match. Hulk won the match by disqualification after Akeem pulled the referee between himself and Hogan injuring him. 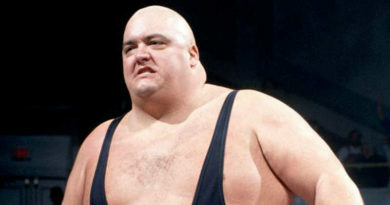 After the referee was knocked out, the Big Boss Man entered and began hitting Hulk with his billy club leaving the fan favorite down and out. Miss Elizabeth was at ringside with Hulk, she left to go try and convince the Macho Man to come down and help Hogan. After Miss Elizabeth was handcuffed, Macho Man came down with a steel chair to save her and clear the ring. Below is a great video clip of what went down. At the 1989 Royal Rumble, the feud between both Hulk Hogan and Macho Man as well as The Mega Powers and The Twin Towers would escalate. It began with Hulk eliminating Macho Man while he thought he was helping him by eliminating Bad News Brown. Miss Elizabeth was able to calm down an irate Macho Man before the duo, temporarily putting their differences aside, shook hands. At this point in the Royal Rumble match, the ring was empty besides Hulk Hogan. The next two participants were The Twin Towers: Big Boss Man and Akeem. They proceeded to double team him eliminating Hulk from the Royal Rumble. This would lead to the infamous tag team match between The Mega Powers and The Twin Towers that would officially break them up. 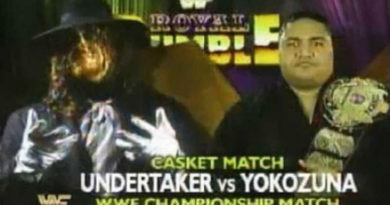 This match took place in February of 1989 at The Main Event. Hulk Hogan left Macho Man in the ring to defend for himself after Hogan left the ring carrying Miss Elizabeth to the back. She was hurt when Macho Man was thrown through the ropes into her. In a classic piece of tag team drama, Macho Man was crawling to the corner finally able to make a much needed tag only to find that Hulk had left him. Eventually Hulk returned and Macho Man became the bad guy by slapping the Hulkster and leaving him all alone to fend off The Twin Towers. In typical Hulk fashion he was able to beat the Twin Towers before his backstage confrontation with Macho Man setting up the main event of Wrestlemania V where The Mega Powers would explode. For over 3 months, The Twin Towers played a crucial role in both single and tag team matches that lead to The Mega Powers ultimate demise when Macho Man turned his back on then best friend, Hulk Hogan.